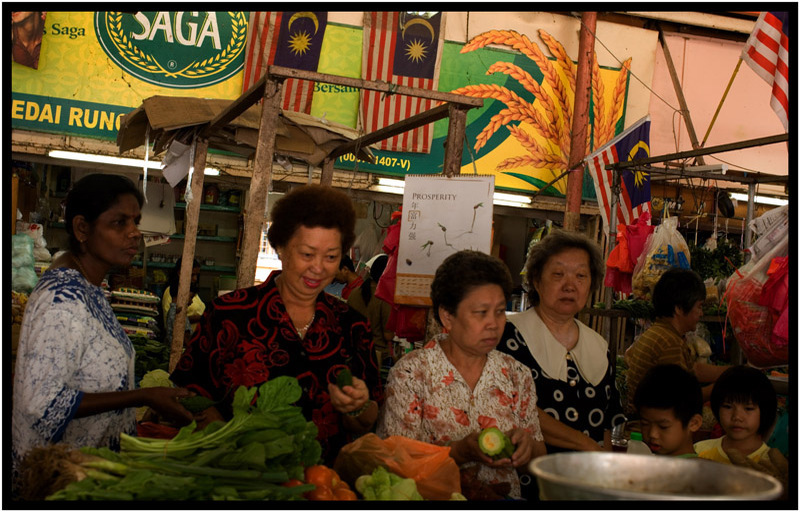 Should the Ministry of Tourism want images with which to promote multi-ethnic, multi-religious, multi-cultural Malaysia, it needn't look farther than Pasar Bandar Baru Sentul ('New' Sentul Market). Ramshackle appearances aside, the thirty plus-year-old pasar is a Malaysia-Truly-Asia marketer's dream. The cavernous structure, anchored at one end by a Chinese temple,is located a short walk from Amru Ibni mosque and sits just across the street from Kuil Sri Maha Kaliamman (a Hindu temple). 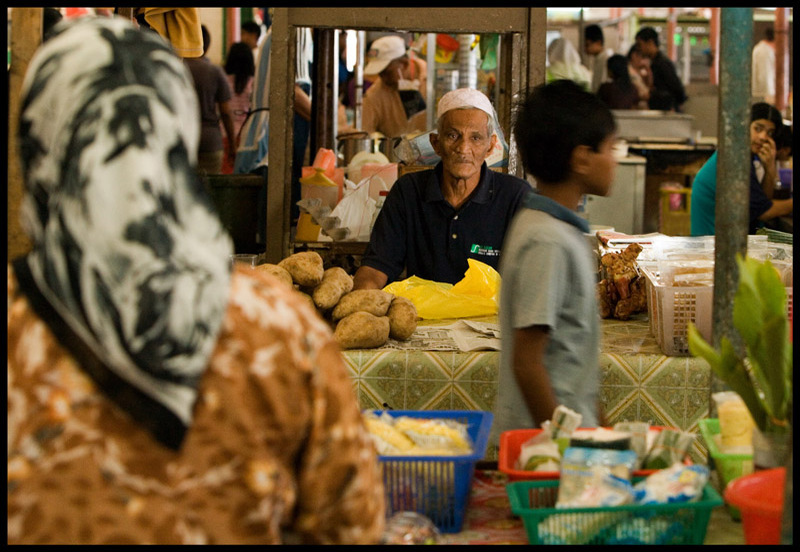 Inside, the market is a seamless transition, over the length of a football pitch, from Chinese to Malay and Indian sections, each populated by vendors of fresh ingredients and cooked delights. A tiny pork stall, partially obscured from view by corrugated metal dividers, sits just behind the Chinese temple's main altar. 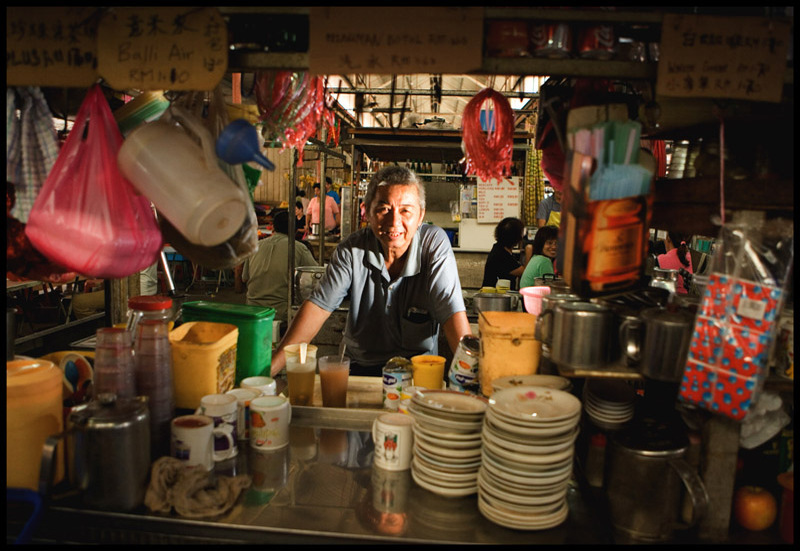 Beyond, incense curls over the heads of grizzled caffeine jockeys filtering their thick brew, a couple tending to customers at their bounteous kuih cart, and sellers of noodles and yung tauhu. At tables interspersed amidst the food and drink stalls Indian and Chinese sup on curry laksa, char koay teow, and Cantonese fried mee as they're serenaded by the faint strains of Chinese opera. 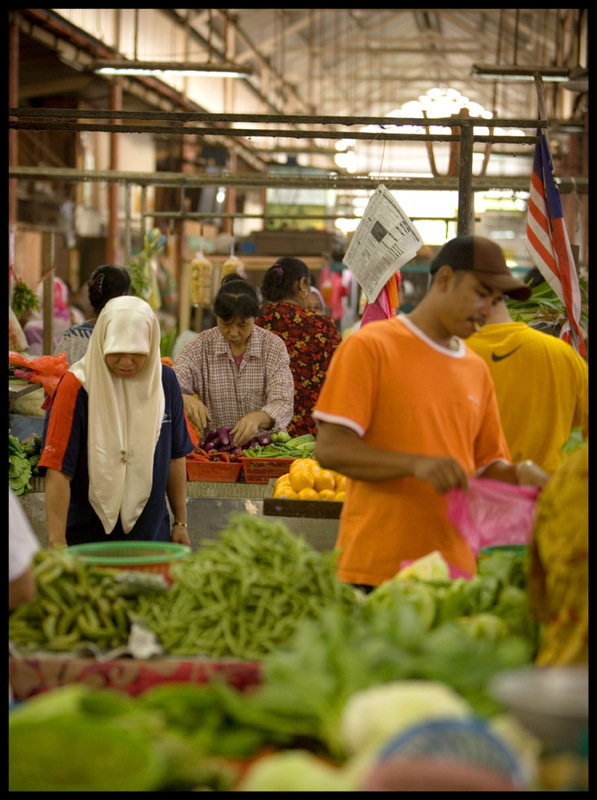 Plastic net bags of mandarin oranges and bunches of bananas suspended from the rafters of fruit stalls mark the beginning of a vegetable section heavy on Malay and Indian goods. Stacks of burdock root and bundles of choy sum give way to curry leaves and daun kesom (polygonum), pristine pucuk paku (fern tips), and mounds of lengkuas (galangal). 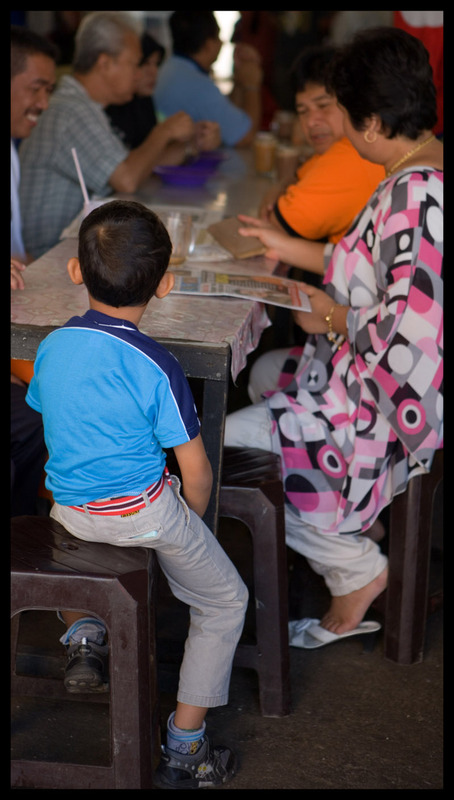 Seats and tables sit cheek to jowl with stalls offering me rebus and soto ayam, nasi lemak, freshly griddled chapati, and pillowy appam. 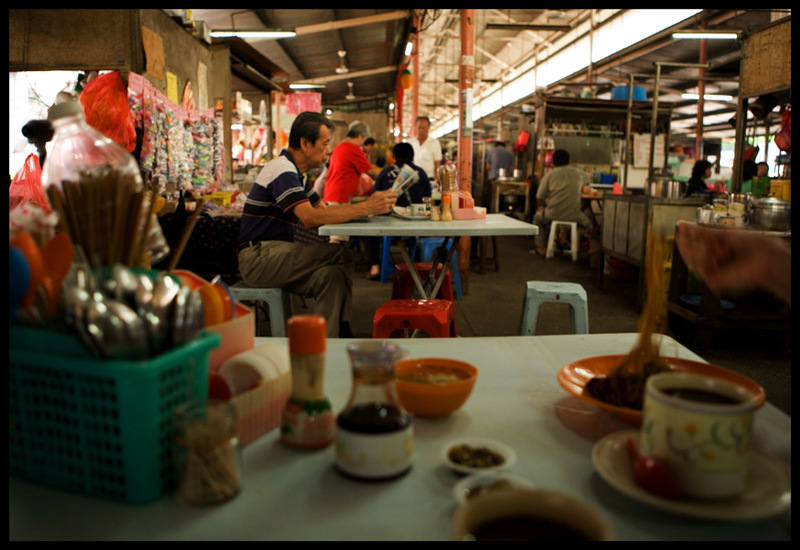 A row of sundries shops operated by Malays, Indians, and Chinese line the market's back wall. Indians heading to the temple pick up jasmine garlands at the flower shop as home cooks with curry on their minds queue for grated coconut and freshly extracted santan (coconut milk). 'Hey there, how you doing, Cat Man?' 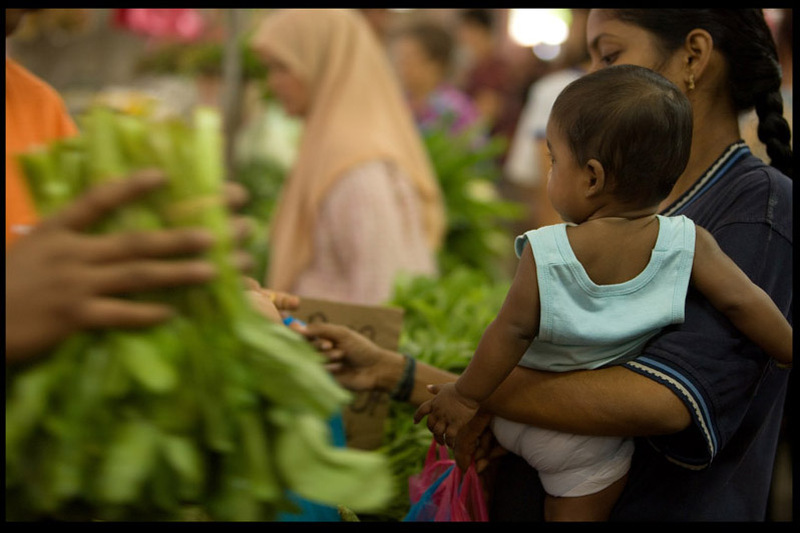 asks a Malay dad, young sons in tow, as he passes an elderly Indian gentleman scratching the heads of one of the market's resident felines. Cat Man beams at the kids, nods to their father. From behind the counter of a vegetable stall two rows over, a vendor in her thirties gently pushes a gratis bundle of chilies into the hands of a protesting granny. 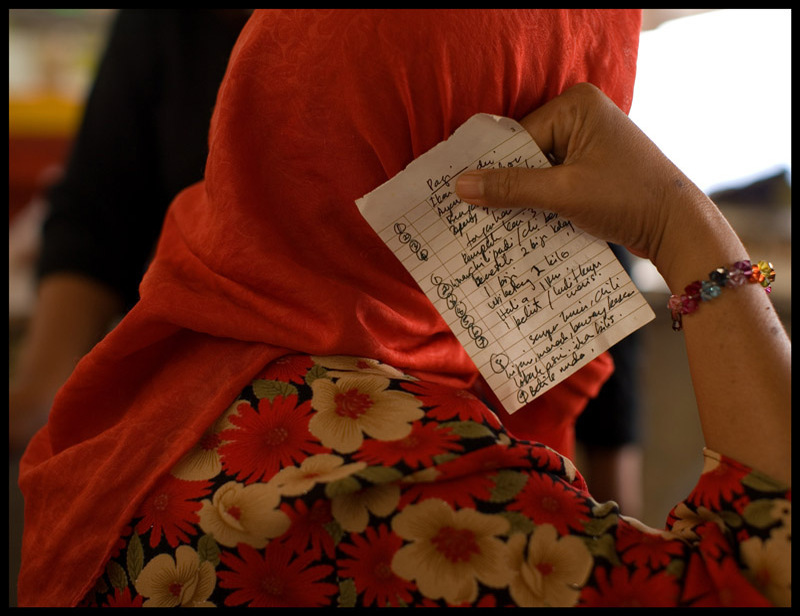 In this cramped center of culinary commerce the residents of Bandar Baru Sentul seem to have found the sort of amiable coexistence that, at times, eludes other parts of the Klang Valley. It's a sociability that hasn't been willed from above, but that has come about as a result of the market's position between several large mixed-race housing flats. Sellers and customers live together, shop together, and eat together. Over more than three decades this commercial space has become not only an extension of the neighborhood but a source of community, and pride, as well. 'Look at this market!' 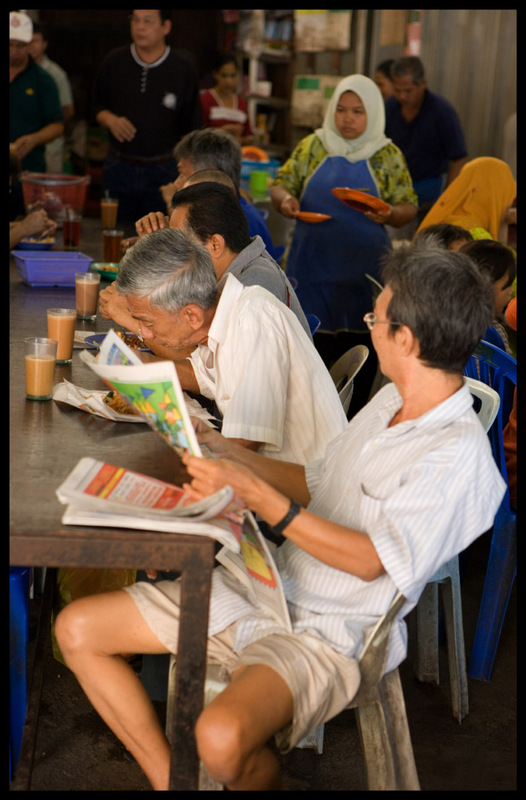 instructs the youngest of a group of Chinese men reading newspapers and sipping teh tarik as, nearby, an elderly Indian woman rolls out dough for chapati. Four blocks away, opposite the mosque, the finishing touches are being put to a new three-story building. Its completion will herald the end of old Pasar Bandar Baru Sentul, a prospect greeted here with ambivalence. While most agree that the cheerfully painted structure's spanking new cleanness will be welcome, vendors fret over rents that will rise significantly with relocation. Meanwhile, customers worry about convenience; for the market's many elderly shoppers, especially, the extra walk will be a burden. Then there is the new building's design. The old market vividly illustrates the social function of Kuala Lumpur's (and all of Malaysia's) traditional wet markets - there's more being exchanged here than goods and money. With its open layout, narrow aisles, and tables placed willy nilly, the old market effortlessly integrates business and pleasure. Should friends or acquaintances meet over piles of produce, there's invariably a spot nearby to which they can repair for a cup of coffee, all the while remaining within gossiping distance with the produce vendor. In the new building fresh and prepared foods are relegated to separate floors. A food court, comprising stalls arranged single file along an exterior wall, facing outward and beyond conversation range of a clutch of permanently fixed tables and chairs, seems unlikely to encourage social exchange either among vendors or between sellers and customers. 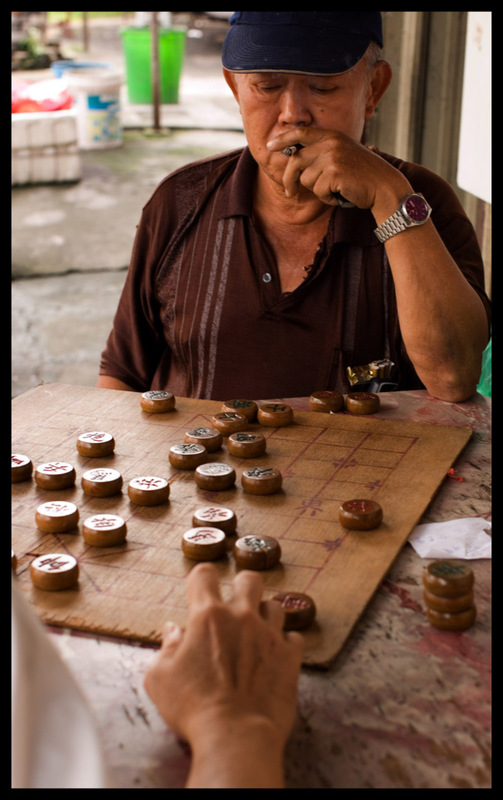 Only time will tell whether or not the new Pasar Bandar Baru Sentul will earn the affection of its community. The old market is a tough act to follow. Ah, if it ain't broke, why fix it? And this: "Sellers and customers live together, shop together, and eat together." It's why I love markets (not to be confused with supermarkets). Hi Robyn. I am from Bandar Baru Sentul. I recall my mother coming back from the market one morning telling me that an expatriate couple were enjoying a bowl of laksa at the market. That must be you and David. Market like this is where people socialise to network and exchange info! Julie - exactly! Or, if it needs some tweaking, then tweak it. Just don't get rid of the whole thing. I'm with you on markets. Every day I've been to a wet market is a good one. Saida - thanks very much.